Susan Vaught's Going Middle Grade! So I've learned one thing for sure in my job: When Susan Vaught says she'll give something a try, be prepared for some results! I think it was back in the spring when I suggested that Susan, who has published over a dozen YA novels, might be a good fit to write contemporary middle-grade fiction. She has a knack for creating protagonists whom readers love and want to protect, and I thought that might be a good fit for the younger market, too. BLESS YOUR HEART is the temporary title of the novel I pitched a Fannie Flagg meets WONDER, with a mystery twist. As many of Susan's book do, this one draws on both her Southernness and her professional experience helping patients and families navigate life with mental illness. Footer, the main character in the story, has a mother who is bipolar, and who is sent away to a hospital to get stabilized at the beginning of the novel, a not-unfamiliar event to Footer. There are also loyal best friends, adults on the periphery who keep an eye out for Footer whether she knows it or not (which is where the WONDER comparison comes in), and a mystery involving a fire at a nearby house and two missing kids. The voice, though—the voice is what will get you! Footer is funny and genuine and full of attitude, even as she worries that she might be sick like her mama and fights against that idea with all her being. The lucky auction-winning editor, Sylvie Frank at Paula Wiseman Books, didn't need a whole lot of luck here, actually; she brought to the table a boundless enthusiasm for Susan's work, the backing of a great team at S&S, and well as her own careful thoughts about how this story and Susan's career might be shaped from here. I couldn't be more thrilled. Suzanne Nelson Breaks Out with a Hot New YA! Suzanne Nelson is no stranger to the world of book publishing—a former book editor herself, she has published a number of fun middle-grade/tween books, including Scholastic's THE GHOUL NEXT DOOR and CAKE POP CRUSH. Recently, however, Suzanne's talent has pulled her in yet another brand new direction. We began working together officially this summer, and the project we connected over is a stunning YA novel entitled SHOES IN THE STREET. This epic tour-de-force begins in WW2 Germany, where a teen girl creates a beautiful pair of hand-made pink heels—which are they lost when she and her family are taken away to a concentration camp. These shoes form the backbone of the story, knitting together the girl who created them and the girl who eventually finds them, dozens of years later—along with many others whose lives are touched along the way. Deep and thought-provoking and incredibly moving, SHOES IN THE STREET is a novel you won't want to miss, and it's one that I know you'll be hearing a lot more about up ahead. And now I'm delighted to share the best news of all: SHOES IN THE STREET has been acquired for publication, by Michelle Frey at Knopf, with a tentative publication date of Fall 2015! Hooray, and huge congratulations to Suzanne! You know those life-changing moments, when everything you expected does not come into being, and the unexpected things that seem scary at first turn out to be wonderful? That describes a new middle-grade series by Phil Bildner. The first two books were just signed by Wesley Adams of Farrar, Straus Giroux BYR, and book one will be on bookshelves in spring 2015! Phil tells me he's been working on these books for six or seven years, all told. They're written from the point of view of fifth grader Mason, who is a basketball fanatic, and whose best friend, Blake, is even more a basketball fanatic, and who happens to have Asperger's Syndrome. The books were pushed to publication after a lunch meeting with Wes Adams, who encouraged Phil to have more classroom-centered scenes, to develop a strong teacher character, and to put more of Phil himself into the stories. Phil spends the school years travel to dozens of schools each year--over 40 between the start of this school year and winter break alone--and he well knows the issues plaguing schools these days. This meeting resulted (after a lot of hard work by Phil) in new stories featuring an enigmatic, unorthodox teacher, and Mason and Blake starting fifth grade with everything unexpected unfolding before them: No just a new teacher, but budget cuts, a new basketball coach, free time to read in class, and best of all, no homework! And these new stories resulted in enthusiastic support by Macmillan and FSG. So, she's already got four picture books, two middle-grade novels, and one YA novel on the shelves--four of which came out this year alone--but there are now three more books on the way for powerhouse agent and author Ammi-Joan Paquette! As reported in today's PW Children's Bookshelf's rights report, Joan will be launching a new middle-grade series called Princess Juniper with Philomel, edited by Jill Santopolo, starting in fall 2015. The series features a princess who asks for her own kingdom for her 13th birthday, only to find that running a kingdom is about much more than wearing ball gowns and throwing parties. Jill has signed up three books, all because of a wandering conversation, an old project in a drawer, and a polish of a proposal. Way to be in sync, Joan and Jill! A lovely hullabaloo of a book for you this fine autumn month! 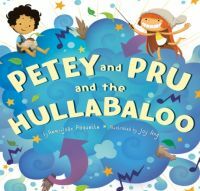 Petey and Pru and the Hullabaloo, by Ammi-Joan Paquette (illustrated by Joy Ang), published by Houghton Mifflin Harcourt, is the story of two opposites who learn the meaning of friendship through some wild and hilarious antics. And it’s a THIRD picture book deal for Nancy Tupper Ling! It's been a busy year for Nancy Tupper Ling, beginning with the sale of THE DOUBLE HAPPINESS BOX to Chronicle in March, then THE YIN-YANG SISTERS AND THE DRAGON FRIGHTFUL to Putnam just last month. Today, I'm thrilled to announce another brand new picture book deal for Nancy! THE STORY I'LL TELL is a gentle and moving origin story, where a mother weaves together fantastical stories and tall tales to tell how her baby came to her. Each story contains a little kernel of truth, piecing together the baby's journey across a wide ocean and into her new mother's arms. This gorgeous story of adoption and parental love is heartwarming in the truest sense of the word, and sure to become a classic. I'm thrilled to share that THE STORY I'LL TELL was acquired by Jessica Echeverria at Lee & Low! Hooray and congratulations to Nancy! Sneak a Peek, Jean Reidy! It's deal announcement time again! 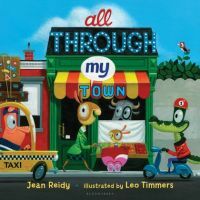 We're so pleased that Jean Reidy is reuniting with Bloomsbury and illustrator Leo Timmers, because we are in luuuuuurve with All Through My Town. This time little readers will be delighted with all kinds of construction busy-ness, and just might learn the days of the week along the way, in Sneak a Peek Construction Week. The wonderful Caroline Abbey takes over editing from Michelle Nagler, Jean's Bloomsbury editor for several years, after Michelle's recent move to Penguin Random House. Jean has a lot of irons in the fire right now, let me tell you, and we're thrilled to see more of her books on their way into readers' hands!